This book was recommended to me by Lindsey, and it continues my tradition of having never received a bad book recommendation from someone I like. 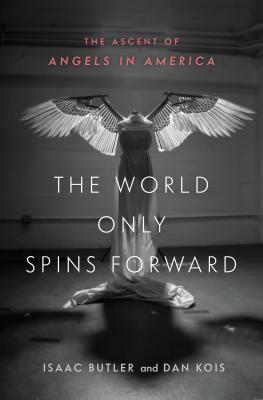 I loved Let the Great World Spin so much that I tried to read it slowly and savor every word. It's loosely based around Philippe Petit's 1974 tightrope walk between the Twin Towers of the World Trade Center, and the interconnectedness of several New Yorkers in the days before and after his famous walk. I cared about each of the characters almost instantly, and I was interested to see how all of the storylines would come together in the end—some do neatly, other connections are a bit vague, but McCann's writing had me hooked until the very last word. I had seen the HBO version of Angels in America many times and read the play, but this oral history of how Angels came to be was so engrossing that I booked tickets to the Broadway production just a few days after starting it. I'm so glad I did because by the time I finished the book I was itching to see it on stage, and knowing the backstory made it even more enjoyable to watch. If you're not familiar with Angels in America, it was basically the Hamilton of the early '90s. It is undoubtably a masterpiece, and I have an even deeper appreciation for the story after reading about its origins. Sometimes I find oral histories to be confusing and disjointed, but this one was entertaining, fascinating and never hard to follow. I plucked this novel out of the dollar section at the Strand based on the title and its synopsis, but I didn't realize until I started reading that it's a young adult novel. This isn't necessarily a bad thing, but I was hoping for more gritty funeral business details—instead I got a light, easy-to-read coming-of-age novel about Donna, a girl adrift a few years after her dad's death. She finds her calling within the local funeral home (and pursues an education in mortuary science) with a little teen drama—an impossibly cool new friend, a scumbag college guy, a little bit of light witchcraft, a new boyfriend for her mom, etc.—along the way. This book never quite lived up to my expectations and after reading nearly 400 pages about Howard Thurston's life, I'm skeptical of his standing as "The Last Greatest Magician in the World." Thurston isn't nearly as well-known today as his rival Harry Houdini—and this book does a good job of showing why (probably not Steinmeyer's intent). The evolution of different tricks and magic trends is interesting, but I just never cared much about Thurston or how he got to be one of the most famous magicians in the world at the time. Even the design of his beautiful stone lithograph posters—arguably the most interesting thing about him—was inherited from Harry Kellar, Thurston's predecessor and somewhat reluctant mentor. If you're a New York history nerd like me, you'll love this book about Broadway, one of the most famous streets in the world. Leadon travels north on Broadway one mile at a time and all of the great New York characters make an appearance—Robert Moses, PT Barnum, Boss Tweed, etc. I wish that there had been more recent history included—most of the stories are from the 1800s—but I plan on doing my own research by walking all 13 miles of the Great White Way sometime soon. Follow along with my reading challenge and let's be friends on Goodreads!